When I brew a beer, I pluck a random shape or symbol from the air and scrawl it on the brew plan. That symbol then acts as an identifier for the beer. When it comes to bottling, I label each bottle with a small sticker that bares the same symbol. Previous examples include a black spot, a pink spot, dashed lines and a triangle. It's a low-tech solution to a problem that any home brewer will face. With the aim of brewing a bit more regularly, I think it's about time I improved upon this. Above is a label I knocked up as an example. 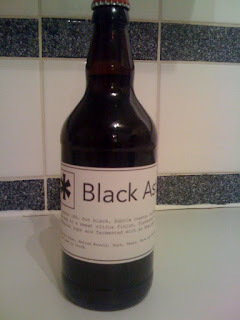 It's loosely based on the black IPA I brewed (which was identified by an asterisk), but only for the purposes of designing a label - it isn't the actual label! All future brews will be labelled in the above style, the information changing as necessary but the layout and design remaining the same. The box in the top left will give a nod to the old symbol labelling, whilst the extra information will make it easier when sharing the beer with other people, and keeping track of alcohol content and bottling date. It's quite plain and simple; but I kind of like that. It'll make it easier to print and to re-design when I bottle a new beer. Below is an example on a bottle. What do you think? My better half suggested you should use the symbols as a possible name for your brewery ie : black spot brewery(or something like that). Tried the bitter last night, went down incredibly well, will send you an email with some tasting notes. Speak to you soon. I like it mate, looking good. I like that you use ingredients on the label too, that's good. How is the beer tasting? Is the low ABV IPA ready? RBF: Interesting idea. I was thinking that beer could be called "Black Spot Bitter". Mark: Dry hopped it last night. Im uber critical of the beer I make, but I think it could do with more body, more sweetness and more hops. Body and sweetness is an obvious problem with low abv, hops is probably because you can never have too many hops! Will probably bottle it over the weekend, so I might have a bottle for you on Saturday. All depends on the dry hopping and how long it takes. Looks good - never been bothered to try making labels myself, despite being such a label/badge whore....!! looking good. I like the simplicity. what are you doing as far as keeping the print from running w/ moisture? fixative spray? I'm not using anything to seal over the top of the labels. To be honest, it would be a solution to a problem that I don't really have. Labelled bottles only got to friends, other home brewers and family, so if the ink runs it isn't really the end of the world. You have a good (quick and easy) solution for preventing the ink running at all - I might be tempted to just do it if it doesn't take much time or effort. I started collecting beer bottle labels and other beer advertising when I was about 10 years old. Over the past 30+ years I’ve come to specialize in vintage U.S. beer labels (pre-1960) and I have amassed one of the largest U.S. beer labels stocks in the world, so when the internet evolved, selling the duplicates online was a natural progression of my hobby. Custom Glass Dispencers can be used for serving the beer in the hotels and party events. Glass bottles are 1st choice for storing the beer, these glass bottles are remain shiny and clean after a long period and it always be feel fresh while some one drinking beer form the glass bottles. As we can see on the above picture the beer labels and glass bottles looks very shiny and clean. The best beer is always made by the best brewer without using the brewing kit you can’t be able to make the best beer for drinking. The best home brewing kits is one of the best and ultimate kits which are using in the home for making the beer tasteful and good for drinking.